Connect with the Teachers of Light directly as you absorb the energetics embedded in every page of this book. Access free supplemental meditations, lectures, videos and animations from the actual Mastering Alchemy course, guided by the Teachers of Light. A free, private online classroom is available only to readers of this book. This unique, interactive book offers a self-contained programme to access a totally new way of life. It is a A Course in Miracles for the 21st century, reaching far beyond that earlier initiative by incorporating the profound Shift in human consciousness that has been occurring over the last few decades. A Course in Mastering Alchemy has been specifically orchestrated by the Teachers of Light to expand your understanding, your consciousness and your ability to use the new energy tools and manifestation techniques they offer. Alchemy is the ability to alter the frequencies of our thoughts to change how you perceive and interact with the world. Begin to experience a new higher level of conscious awareness. To master alchemy, new energy tools of unparalleled capacity have now become available. These are provided here for the first time in book form by the Teachers of Light. 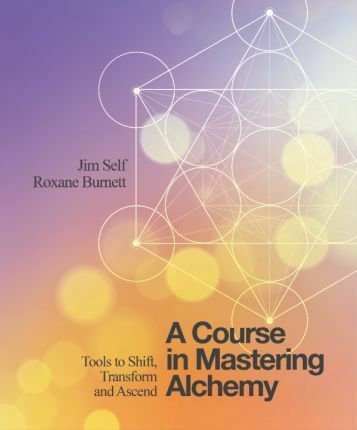 The guidance of these Ascended Beings has been given to Jim Self and Roxane Burnett and are presented in the hugely popular online Mastering Alchemy course. *	Become conscious of the rules and limitations of your present reality. *	Recognize that much of who you believe you are actually has very little to do with who you really are. *	Step out of the unnecessary concept of "suffering" into a state of complete wellbeing. *	Begin to access your highest consciousness. *	Create a new, strong and capable platform for experiencing the world. Join with Jim and Roxane and walk the pathway into your personal ascension. Jim Self is an international teacher, speaker and author who has been leading seminars on personal energy management and the tools of Mastering Alchemy for almost 30 years. He is one of the few spiritual teachers to keep pace with the on-going Shift in human consciousness, constantly co-creating the Mastering Alchemy programme with the Teachers of Light, and offering new information through his website in the form of downloadable articles, videos, webinars and ebooks. His audio library includes enlightening discussions with the most interesting teachers and channelers around today. Roxane Burnett is the co-founder and manager of Mastering Alchemy, and the co-author of Spirit Matters. A former corporate art director, she has been offering tools for developing intuition and personal power to individuals, businesses and professional women's groups since 1994.